A legendary exploration of nature from the edge of the wilderness. All the comforts of a vacation cabin rental on this 57 mile journey into the deep forest. The road connects Gunflint Lake to Grand Marais. 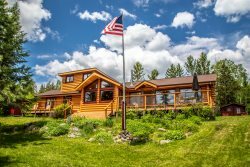 Poplar Creek Retreat is a private, peaceful, and picturesque escape on the Gunflint Trail.